James A. Calhoun (born May 10, 1942) is the former head coach of the University of Connecticut men's basketball team. His teams won three NCAA national championships (1999, 2004, 2011), played in four Final Fours (most recently in 2011), won the 1988 NIT title, and seven Big East tournament championships (1990, 1996, 1998, 1999, 2002, 2004, 2011). With his team's 2011 NCAA title win, the 68-year-old Calhoun became the oldest coach to win a Division I men's basketball title. He won his 800th game in 2009 and finished his career with 873 victories, ranking 12th all-time as of Feb. 2015. Calhoun is one of only five coaches in NCAA Division I history to win three or more championships and is widely considered one of the greatest coaches of all time. In 2005, he was inducted into the Basketball Hall of Fame. On March 2, 2005 he achieved his 700th win at Gampel Pavilion over the Georgetown Hoyas. His friend and Big East rival coach Jim Boeheim also won his 700th game during the previous week. Later in 2005, Coach Calhoun was honored by induction into the Dr. James Naismith National Basketball Hall of Fame, fittingly, along with Jim Boeheim. On February 25, 2009, he achieved his 800th win at the Bradley Center over Marquette. * Connecticut had its 2–1 record in the 1996 NCAA tournament and Sweet Sixteen appearance vacated after two players were ruled ineligible. As of April 5, 2013, Jim Calhoun has a 50–19 (.725) record in the NCAA Tournament, going 2–5 (.286) while at Northeastern and 48–14 (.774) at the University of Connecticut. ↑ "Calhoun, Jim". Current Biography Yearbook 2011. Ipswich, Massachusetts: H.W. Wilson. 2011. pp. 106–109. ISBN 9780824211219. ↑ Wise, Mike (April 5, 2011). "Connecticut Coach Jim Calhoun just won't go away". The Washington Post. Retrieved April 5, 2011. ↑ "A Life Spent Coaching | The Official Website of Coach Jim Calhoun". www.CoachJimCalhoun.com. Retrieved 2012-08-04. ↑ "Calhoun being treated for skin cancer, wants to continue coaching". ESPN. May 30, 2008. ↑ Mike Anthony (June 13, 2009). "Calhoun Breaks 5 Ribs, Collapses At Charity Bike Event". The Hartford Courant. Retrieved June 13, 2009. ↑ "UConn hoops coach Calhoun taking medical leave". Associated Press. Retrieved January 19, 2010. ↑ ESPN News Services. "Jim Calhoun on indefinite medical leave". ESPN. Retrieved February 4, 2012. ↑ ESPN News Services. "Jim Calhoun returns to coach UConn". ESPN. Retrieved March 7, 2012. ↑ "Calhoun's Hip Surgery Likely Won't Stop Him From A Return To Coaching". CBS News New York. Retrieved 6 August 2012. ↑ "UConn Huskies Calhoun bio". Archived from the original on October 11, 2008. Retrieved November 15, 2008. ↑ CNNSI.com, March 23, 1999 "Calhoun riding an emotional wave to St. Pete"
↑ "UConn Huskies Calhoun bio". Archived from the original on October 11, 2008. Retrieved Nov 15, 2008. ↑ LeAnne Gendreau (2010-05-07). "Calhoun, UConn Agree to Contract Until 2014". NBC Connecticut. Retrieved 2012-08-04. ↑ "NCAA committee bans Jim Calhoun of Connecticut Huskies from three Big East games – ESPN". Sports.espn.go.com. 2011-02-23. Retrieved 2012-08-04. ↑ EATON-ROBB, Pat. "UConn men's basketball coach Jim Calhoun retires". Yahoo! News. Retrieved 13 September 2012. As a result of the 2011 NCAA sanctions imposed on Calhoun for recruiting violations, the 2–1 record compiled by Connecticut while Calhoun served his three game suspension was credited to assistant coach George Blaney. AP (January 5, 2012). "Jim Calhoun not credited with wins". ESPN. Retrieved January 6, 2012. 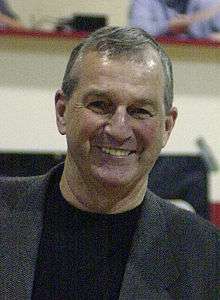 Wikimedia Commons has media related to Jim Calhoun.